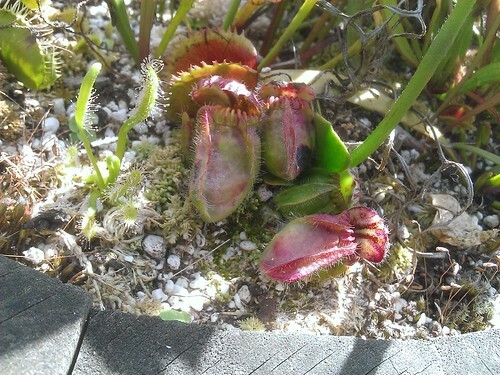 I have a Cephalotus that I am sacrificing for the sake of experimentation. Every year without fail it suffers from powdery mildew it has annoyed me too much now, as yet again it is covered in the stuff. 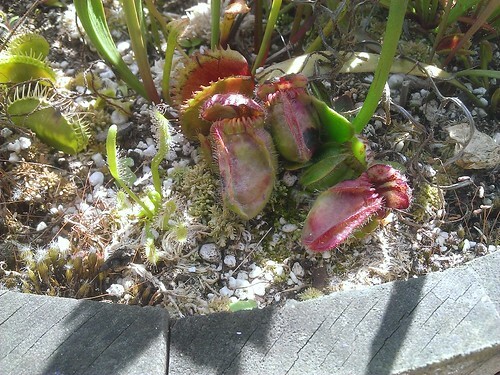 Others in the same place and conditions don't get any really but this particular plant always does and it gets it bad. 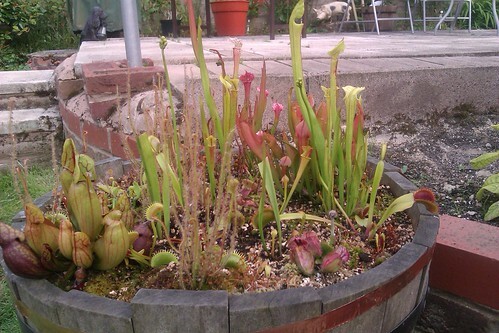 I got Fed up with it this year so I put it outside in my bog tub about two weeks ago. 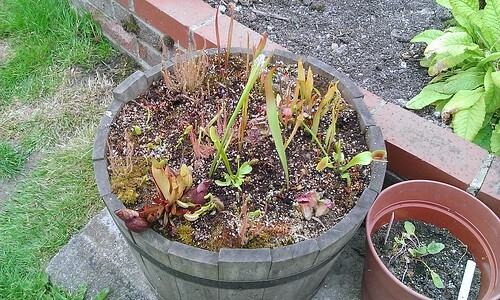 The bog tub receives very good light and full sun all day, it gets no winter protection but so far any plants I have put in this bog have survived the winter OK. 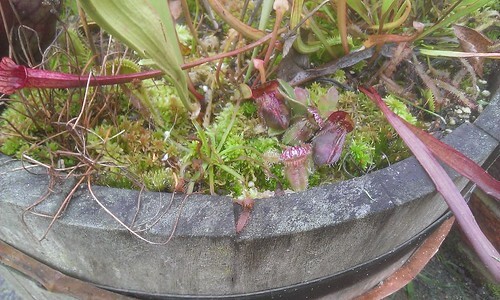 It is sending up a small flower stalk but the mildew only looks slightly better if at all. 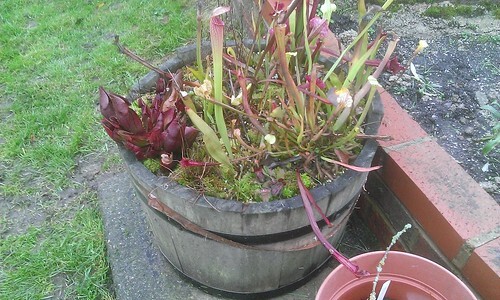 I plan on leaving it out all winter in the bog as I don't mind if I loose it (I expect I will) I will keep this updated by adding photos of it to prove it's left out there all summer and winter and to see how it does and to see if the mildew clears up now it's in it's new permanent home. 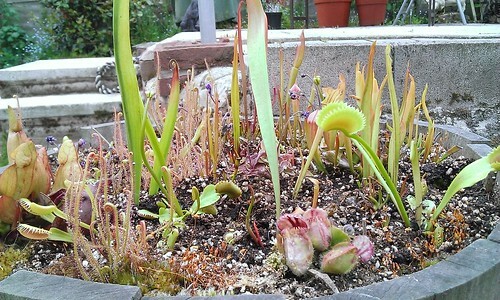 At least some of the sarracenia will survive if you leave it out in Winter, but I'd be very surprised if your cephalotus doesn't bite the big one. Sarras have already survived a winter or 2 in the tub, the tub itself is very heavy and unmoveable and the bottom will fall out if moved. 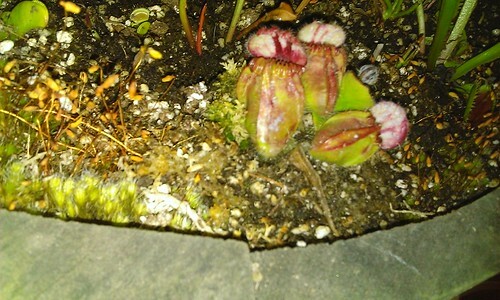 My Cephalotus survived outside last winter as it has the same affliction and I feel the same about it. The mildew must keep it alive so it can annoy you for another year!! 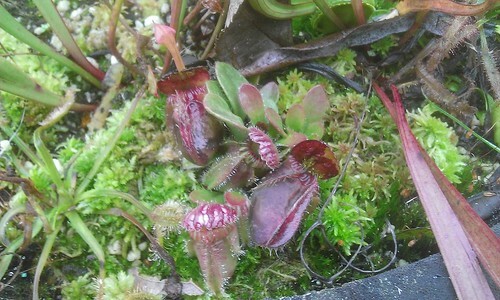 A month outside in the bog and the little guy is doing Ok. This plant is going to be subjected to some harsh times but seems to be coping OK with it's first test. Remember I upped it out of its pot and repotted it outside in full sun (although we haven't had much sun really) whilst it was flowering in summer a big no no some would say, especially for a mildew ridden small flowering ceph. The mildew has nearly all gone and looks a tad healthier also coloured up slightly, the rest of the bog has got going a bit also after a slow start this year. Looking great, I'm glad the little guy's recovering. Mine got mildew last year, putting them outside worked for me, even though it did nothing but rain mostly. I wouldn't have the heart to leave him outside all winter though ! 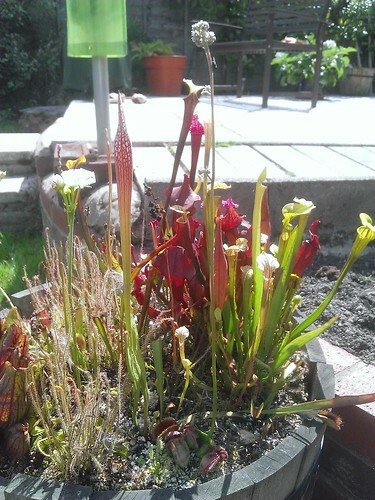 Here it is in August it has only produced like a couple of leaves and a very small pitcher which are all mildew free! which is good considering everything. It has flowered and seems OK. The real reason it's out here now is to get it settled in to it's new home to give it a fighting chance to see if it will survive the winter. Seeds from this plant will be ready soon if anyone wants any. looks great , cephs look happy too . Just a quick update, the Ceph living outside with no winter protection is still alive and looks OK for now, we have had some below freezing temperatures already only time will tell if it will make it through the whole winter. Great to see you back on here Matt, hope you've sorted out your problems, you've still got a lot of your collection left, and you didn't have to get rid of too much ! 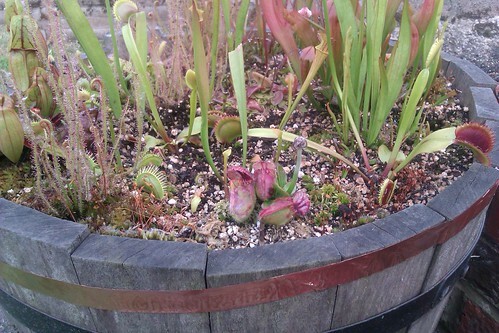 Nice looking barrel bog and good to see the little guy is free of mildew. I it makes it will it not live in the bog full time or any plans to bring it back in? 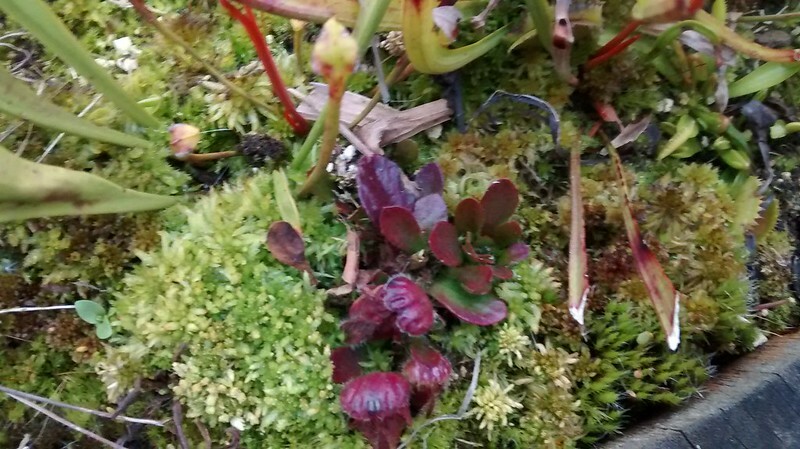 Well it survived the whole winter outside with the elements, It looks healthy and has new growth points spurting up out of the moss but it was one of the mildest winter's I have experienced since growing CP's so maybe not much of a test this time I will leave it out again all year and see how it does. I also opted to leave the door open all winter in my small Greenhouse which houses most of my cephs, as I usually loose one or two due to bad ventillation over winter, and I didn't loose a plant in there this year. But again is was a mild winter so I cannot really compare it or make any assumptions yet.